Training equipment makes you a better ball player and keeps you learning new things. Simple as that. It can seem complicated so we've decided to make it real simple. We have split our training gear up into categories: Batting Tees, Batting Aids, Training Balls and Training Nets. Just click the heading below for the category of training equipment that best fits your needs! -- Getting your swing right is key in baseball and softball. Taking live batting practice helps, but if you are wanting to practice by yourself this is the way to go. Batting tees are one of the original pieces of ball training gear. They help you develop better hand-eye coordination and work any kinks out. Whether your little one has just taken up an interest in baseball or softball and needs a tee starting out, or you need a premier quality tee with super durability that is good enough for MLB and the NCAA, these tees have you covered. -- Batting aids are key items both during the season and in the�offseason to help you stay on top of your game. They have no downside. Specialized batting aids like bat weights, hand trainers, and pitching machines can help you improve strength, speed, and hand-eye coordination, or allow you to practice on your own. It is as easy as swinging in your garage or basement during the winter. After some work with these, swinging a "normal" bat will seem a lot easier! -- Everyone loves working on their hitting, but when it comes to fielding and pitching, training balls are the way to go. Training balls are an essential training tool and have a variety of specific uses. When you start using training balls, you can find and work on your weaknesses. You will be able to work on arm strength, release point and all around mechanics. Depending on what type you choose, they can help young players drive through the ball, improve your reflexes with unexpected bounces, help you pitch with no release and improve your hand-eye coordination. -- Playing games is great in baseball and softball. The ultimate goal is to get better and better as the season goes on. The old saying is "practice makes perfect." The sports of baseball and softball are all about repetition. One way to practice is with a hitting/throwing net. 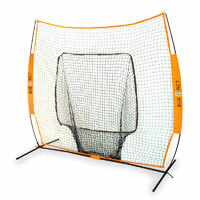 These nets allow kids to practice on their own time away from team practice. The more they hit into or throw into a net, the better prepared they will be for a game. Plus, if it keeps kids outside and active instead of inside playing video games, it's a good investment!